A 20lb lake carp is one thing in and around MK...while a 20 from the local river is a real rarity! But that is what Phil Lee set out to catch from Olney’s Ouse, and a 20-10 is what he landed. And to prove it was no fluke, Paul Andrews had two more carp, at 17 and 14-8, during the same over-night session. That Phil’s fish, pictured, presumably an escapee from a river-side lake at some time, survived to be caught at that weight is a stroke of luck in itself as – judging by its mangled tail – it has had a pretty near-miss with a predator. Maver MK matchgroup’s Roger Clutton managed to spoil a perfect top-three individual AND top three teams sweep for Sensas in this year’s Eastern Region Shield by grabbing third place with 6.5 kilo of slabs and skimmers from the Kings Lynn Ouse. He also won his section, as did veteran ‘medal magnet’ Phil Wintle, to help MK into seventh team spot. Sunday’s Olney-run MK Citizen Cup open was the first in the event’s history not to sell out and that could cost the club dear as it had underwritten the £500 top prize. Top spot went to Pete Hawley with 9-6-8 of roach as Pete Jayes had 7-1 (including a 6-3 bream), Pete Laughton 6-10 (partly a 4lb tench), and Steve Wright 6-8-8. ABOUT the last thing Tackle Hub-staffer Bob Gale expected to take his pellet bait on Tear Drops was a perch. But that's what he got, and at 3-1 it was quite a stripey! 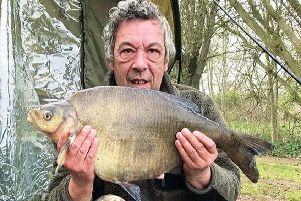 THAT man Geofferson Longley, who last week had a 34-6 on his first visit to Willen, has been back again and bagged a mirror which looks to be of similar size. James Scobie had six fish from 10 to 20-1 on Furzton with Stephen King also getting several doubles. TOVE Valley's Lakeside open fished up a storm, Sunday, as Darren Pannell won with 195-5 followed by Andy Jones 182-10 and Richard King 114lb. Only one rod failed to top 50lb. KINGFISHER's Stewkley Three Islands match fell to Andy Holdaway with 28-9 – thanks to a 12lb carp on the final whistle. Dean Warren had 26-10 and John White 21-4. MK VETS, Stockton reservoir, Martin Cunniffe 16lb, John Hewison 14-5, Steve Chilton 13-7. LINFORD, canal, 'Morgan length: Roy Hefferon 4-8, Ron Dorrill and Pete Whatley both on 2-9. FIXTURES: Oct 16, Towcester open, Castlethorpe cut, 01908 56563617 (evenings). CLOSURES: Saturday, MKAA canal bridges 83-88 closed until 5pm; Brush Mill, Hollands & Toombes Ouse closed until 6pm. Furzton closed Friday thru Sunday 8pm for charity carp match.